The Model BF-4302 is a 4-port USB 2.0 Mini Hub. It features independent current limiting and LED Status indicators for each port. It can be operated as a bus-powered or self-powered hub. 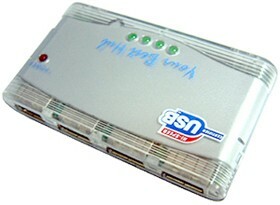 A power supply is included for operation in the self-powered mode. This hub is backward compatible with the USB 1.1 specification.